A complete beginner class on using your computer to create greeting cards. Welcome to the first day of class. If you want to be part of the discussion – head on over to the Digichick Form and say “Hi” in our class thread. In this lesson we will be setting up our Photoshop Elements (PSE) workspace and using a hybrid template to make our first card. A PSE template is similar in some ways to any other craft template. It shows the outlines of the various pieces needed to create a card, but there are some important differences. The PSE template is created in layers – where each shape has its own space in the document. Each shape can be altered or duplicated or even temporarily shut off. Also, digital supplies, like digital papers, can be quickly and easily added to each shape independently. Once you add the digital papers to your shapes, you simply print the pieces, cut them out and assemble the card. The next time, you can use completely different digital supplies and create a whole new card with the same template. Remember that these templates are a jumping off point and that we’ll be adding more digital and traditional supplies to our cards to make them more personal and creative. We’ll also be using more complex templates as the course goes on. For this class, I’ve also created a digital mini kit for your use. Feel free to mix and match any of the papers and other elements to create your projects. Of course you can also use any digital supplies you already own. Digital kits are large, so you’ll be downloading zipped files. Just click on the links below and download the materials to your hard drive. They are broken down into several files to make downloading easier. Go ahead and unzip your files. Inside the folders you’ll find digital papers, labels and sentiments. As the class goes forward, you’ll also be downloading some additional digital supplies. In the first class video, we’ll be using some of these supplies to create your first card. One quick note: These class sessions are filmed in Photoshop 6. If you have an older or newer version – your screen might look slightly different but the functions should still be the same. If you have any trouble, just post a note in the forum thread and someone should be able to help you out. If you just downloaded the trial version of PSE11, your screen will look very different (Adobe made everything fancy). If you’re having trouble finding things, I put a short video at the end of this blog post on setting up PSE11. In this video, we’ll cover setting up the PE workspace and how to open a template document. In this video, we’ll add different digital supplies to the template – click below. In this video, we’ll set up our color management and other print setting and print the document. In the next lesson, we will start altering digital supplies to better fit templates and we will have our first hybrid card challenge – so be sure to check back on Thursday. A short video to help brand new Photoshop Elements users. This entry was posted in Hybrid card class, Tutorials and Quick Tips and tagged DigiChick, Hybrid card class, tutorial on January 8, 2013 by Cathy. During the month of January, I will be posting a free 6 part class on hybrid card making over at the Hybrid Chick Blog. I will also be posting the class content here, but most of the conversation will be over at the Digichick, so come on over and join us! The class will run on Tuesdays and Thursdays. Mark your calendars – we start January 8 with our first video lessons and the free starter kit! In the class, we’ll be creating beautiful greeting cards with a little help from Photoshop Elements (called PSE from here forward) and your trusty printer. But don’t hide all of your traditional card making supplies as we’ll be using them to add special creative touches to your projects. If you do not own Photoshop Elements but would like to give this class a try, you can download a free 30 day trial of the program from Adobe. This class is based on using PSE card templates in combination with digital supplies such as digital papers, mats, labels, sentiments and stamps. All of these supplies can be reused, altered and modified to create an almost endless variety of creative options. We’ll be printing our card components and combining them with traditional card making tools and embellishments to create greeting cards you’ll be thrilled to send to anyone. We’ll start the class by using simple PSE card making templates that I’ve created for you and by spending time getting used to the PE working environment. As the class progresses, I’ll show you some ways to alter PSE templates to suit your project. This is a beginners class, so it will start simply and we will build on what we learn. Creating greeting cards from digital templates. Tips for printing and assembling hybrid projects. Using and manipulating digital stamps and images. Using the Photoshop Elements text tool to enhance your card creations. Altering card template files to suit your needs. We will be giving you some free digital supplies to get you started, but you can also use digital supplies you already have and any of the lovely kits that catch your eye in the store. Be sure to join the hybrid card challenges in the Digichick Challenge forum. 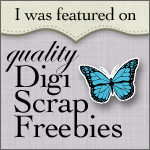 We want to be able to “ohh and ahh” over your creations AND you can earn point towards free digital products. Every week there will be a new (optional) challenge for you to participate in. You can find the Monthly Challenge Thread here. If you need a place to post your creations, you can use our site Gallery. If you have questions or comments, feel free to comment on the lesson blog post or to comment in the Hybrid Happiness Card Class thread in the forum. See you on January 8. This entry was posted in Hybrid card class, Tutorials and Quick Tips and tagged DigiChick, Hybrid card class, tutorial on January 3, 2013 by Cathy.